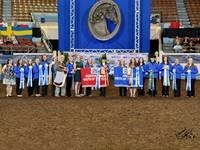 The Youth Council voted unanimously to change the way youth contestants qualify for the Grand National Youth of the Year Contest at their local level contest. Instead of only the winner of the local contest qualifying for the Grand National, now any contestant who scores over 800 points at their local contest will be qualified for the Grand National Youth of the Year Contest! This means there could be more than one youth representing their local show at the Grand National thus making the Youth of the Year Contests more inclusive! AMHA is very pleased by this change and looks forward to seeing the number of Youth of the Year contestants increasing. Youth Contest Coordinators please note: You must now report all contestants who score over 800 points to Katie Hodges at AMHA when turning in your Contest Report Form (instead just reporting the winner and reserve). If you have any questions about Youth Contests or qualifying for the Grand National Youth of the Year Contest, please contact Katie Hodges at (802) 985-4944 ext. 401 or Katie@morganhorse.com.